Monument dedicated in September 2010 on N. Harrisville Rd. ; photo Nicholas Draney/Standard Examiner. Photo Nicolas Draney/Standard Examiner, Sept. 2010. 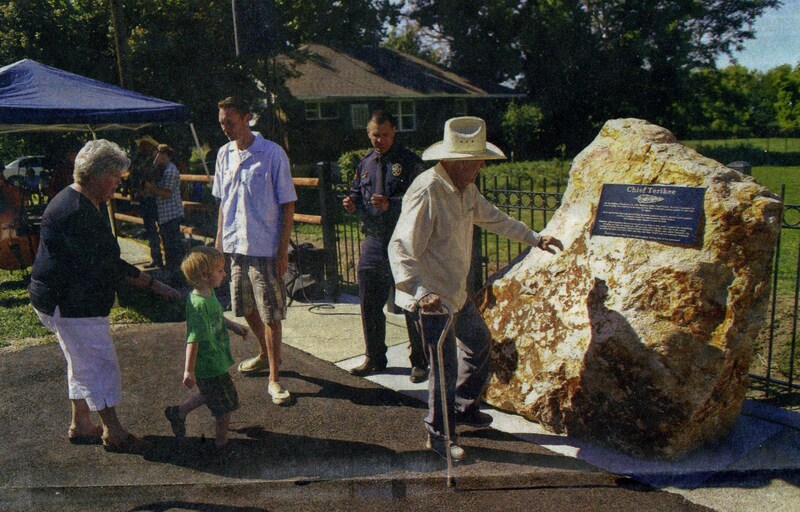 The monument was dedicated in September 2010 to honor Chief Terikee. It stands on the North Harrisville Road, about 200 feet east of where Chief Terikee was killed in 1850. The Shoshones camped for the winter of 1849-50 at the big bend of Weber River. It was estimated that the band with Terikee, their old chief, numbered about 85 warriors and Little Soldeir’s band camped on the south side of Weber River numbered 65 warriors. 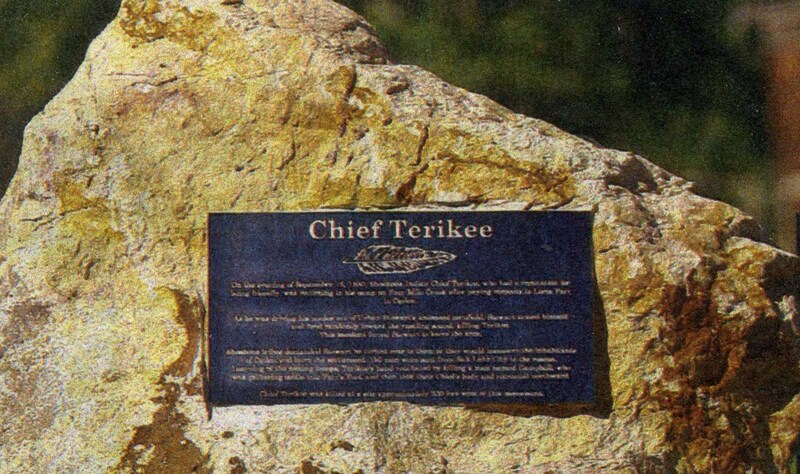 Chief Terikee was known to be friendly to the settlers. On September 15, 1850, he sent his warriors off to hunt until the settlers’ harvest was over as he felt his people were begging too much. On September 16 he paid a visit to Lorin Farr, the first mayor of Ogden, and was planning to follow his band of Indians in the next morning. 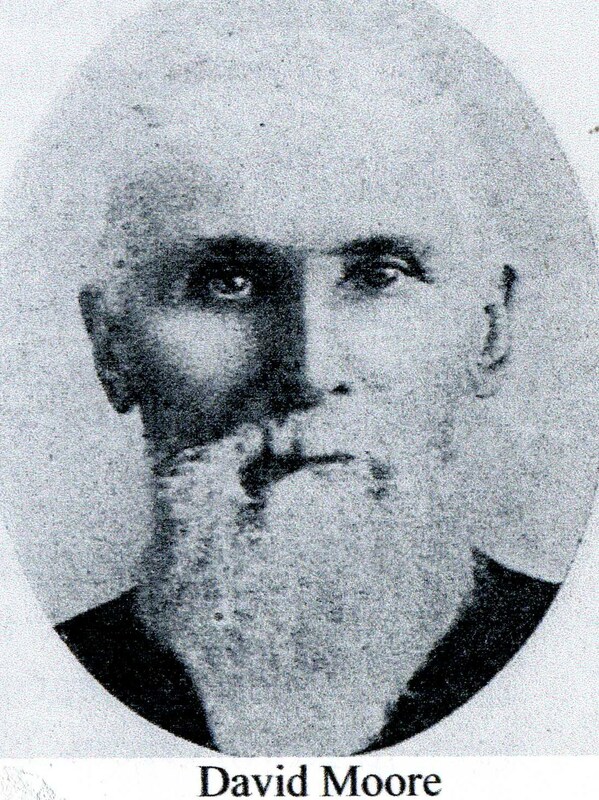 After leaving Lorin Farr, he traveled by Urban Stewart’s farm on Four Mile Creek in what is now Harrisville, and his ponies got into Stewart’s unfenced corn. As he was driving the ponies out, Urban Stewart heard noises and fired at random in the direction of the noises in his corn field. His shots hit and killed Chief Terikee. Realizing he had no chance to explain his error, Stewart fled the county. Chief Little Soldier and his band were enraged by the killing of Chief Terikee and threatened to burn the settlement unless Stewart was given up. After Stewart fled, “George Barker and William Barker went out to Stewart’s place and met Little Soldier’s band of Indians – they returned home about daylight, the Indians following them. When they came to Barkers house they formed a circle around the front of their door. I saw the move and went over near to them – [I was] behind their ponies before they saw me. When Little Soldier saw me he gave a yell and they all wheeled their ponies and closed in around me and Little Soldier brought down his gun and fired it off close to my head and then they all yelled with all their might. When they ceased their yelling I began to talk to them and induced them to go with me to President Lorin Farr’s where we had a long talk with them. They finally agreed to wait until the next day about ten o’clock –[if Stewart was not given to them by that time] they would commence to kill the people and burn their houses and grain. Lorin Farr wrote a letter to President Young in regard to the affair, and David Moore was sent on express to Salt Lake City. While the leaders there were deciding what to do, another dispatch came informing them that some of Terikee’s band had returned and killed a Mr. Campbell in retaliation and run off five head of horses, among them a fine race mare that belonged to David Moore. Brigham Young sent a contingent of 150 Salt Lake militiamen to WeberCounty. The Indians recovered the body of their chief and made a quick retreat north before the troops could overtake them. Both Terikee’s band and Little Soldier’s band were gone when the troops arrived. The next move of the Presidency of the Mormon Church in Salt Lake City was to strengthen the settlement of Weber by sending there a large number of the incoming emigrants. The dedication of this monument became an act of public contrition, a ceremony to honor a tribal leader killed in events that forced the surrounding communities to take precautionary measures against the Indians, including sending more emigrants to the settlement of Weber and building Farr’s Fort. Richard C. Roberts, Richard W. Sadler, A History of Weber County, 1997, Weber County Commission and Utah State Historical Society, p. 96; Sketch by David Moore, Written from records and memory, manuscript, p. IV-VI. Sketch by David Moore, Written from records and memory, p. VI. Ibid; Richard C. Roberts, Richard W. Sadler, A History of Weber County, p. 71.